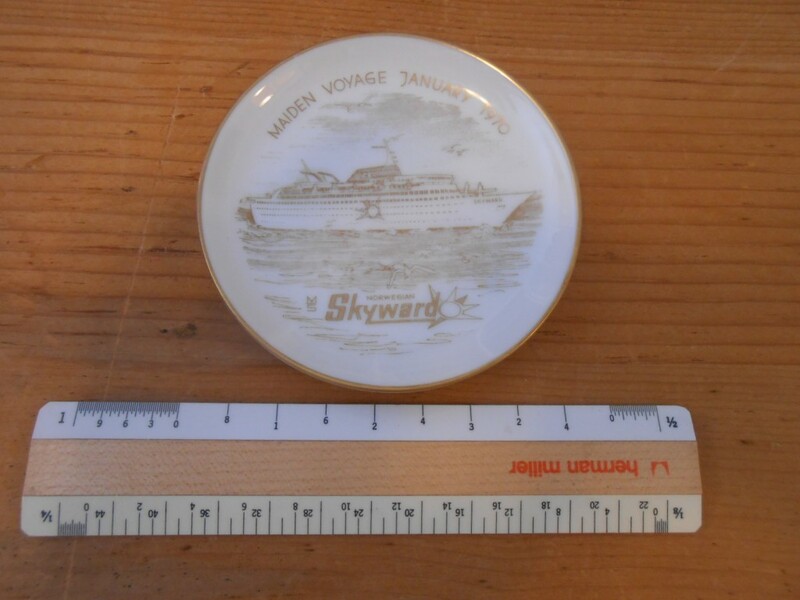 Nice little maiden voyage souvenir dish by wedgwood… wonderful guilt edges and details .. only lacking a profile of the ship =(… I would have expected Cunard to go all out for the maiden season .. Still a nice little high quality dish! 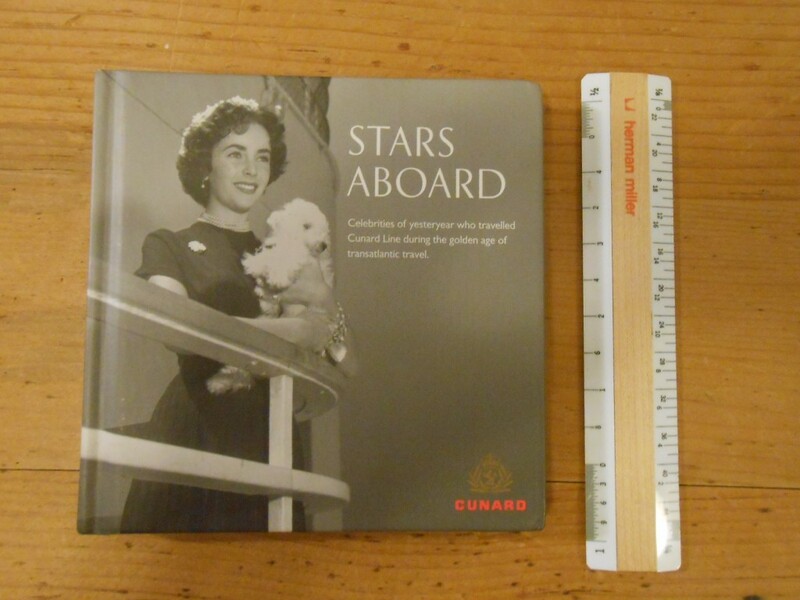 Cunard Line: “Stars Aboard” book. Newer Cute little nostalgic book on famous folks that traveled onboard the Cunard liners. From Eddie Arcaro ( Kentucky Derby jockey) to the Duke and Duchess of Windsor there are about 75 folks covered with pictures of them aboard various ships pre 1967ish. Probably sold in the gift shops on today Cunarders. 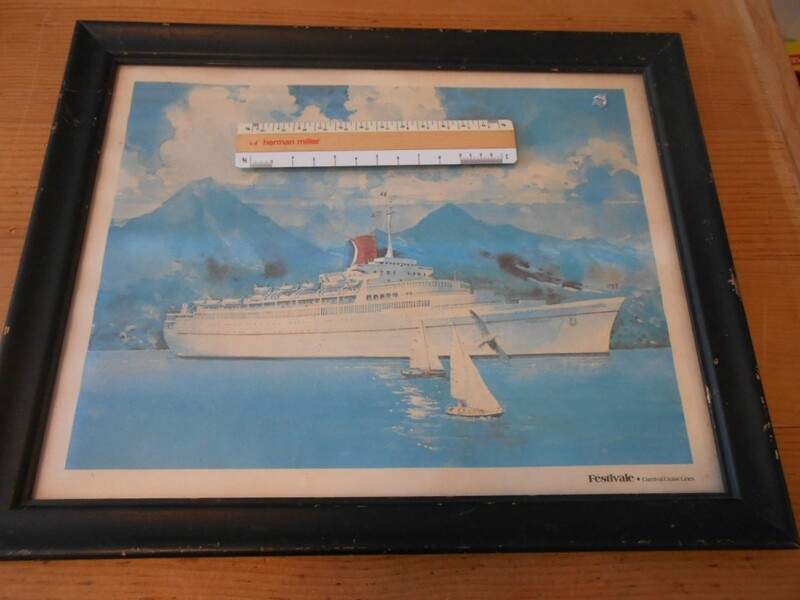 Lovely framed watercolor picture of the Festivale … Carnival’s 3rd ship and formerly the Transvaal castle. The ship was remodeled in Japan and entered service for Carnival soon after. The picture is in a older frame with the typical nicks etc. The back has a “statistics” sheet taped to it with info on the ship. 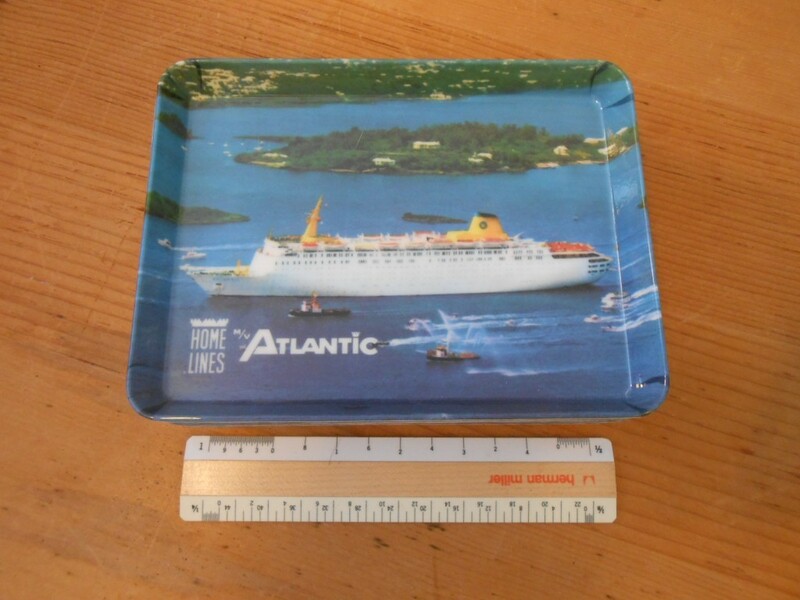 Really cool heavy china tray for Royal Caribbean. could hold quite a few cigs if you are a smoker. Excellent shape! 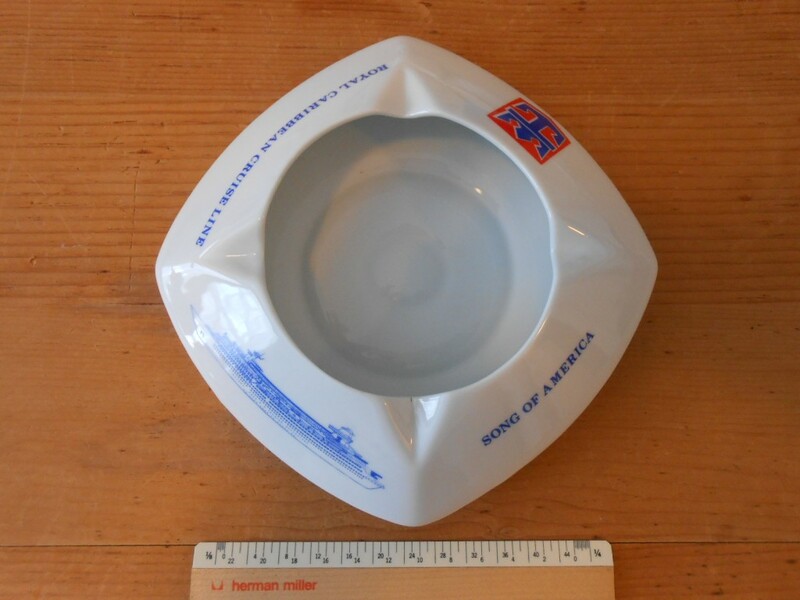 Giant ashtray for RC’s Song of America. 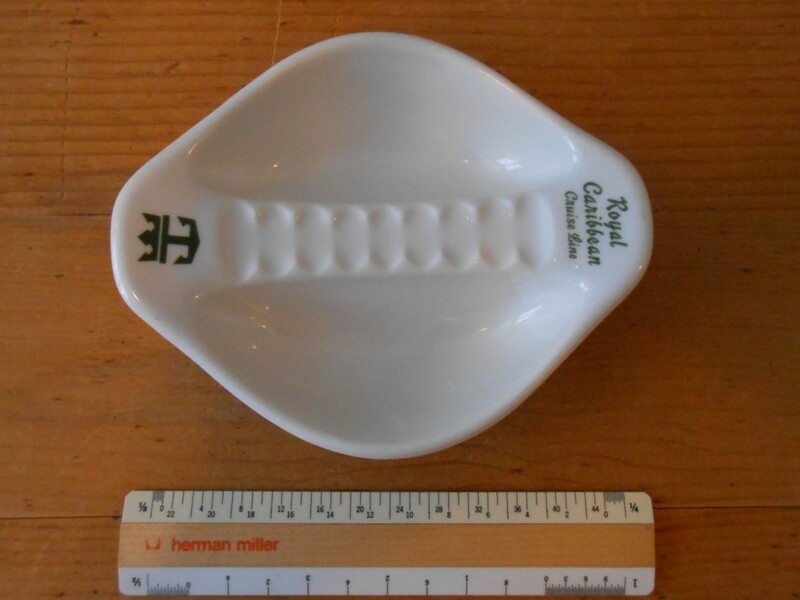 This ashtray is in excellent shape and have an awesome profile of the ship. Probably came from the gift shop onboard. 2 very interesting press photos for RC’s newest ship the Sun Viking. She was the largest ship in the fleet at the time. Love the art work on the gallery lounge wall .. and the mushroom shaped tables. Excellent condition! 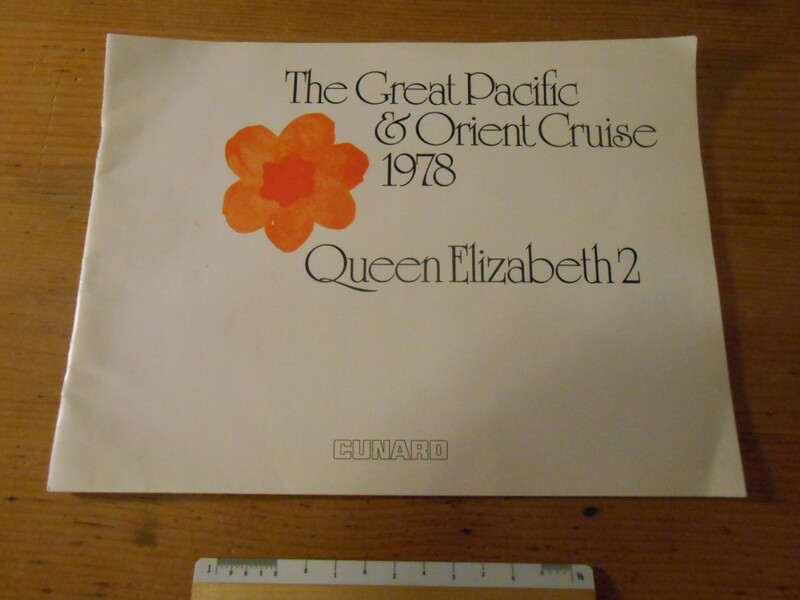 Cunard Line: QE2 Grand Pacific and orient Cruise 1978. I was a whole 9 when the E2 set off on this wonderful cruise around the Pacific! Wonderful brochure with interior pics and route info. Pretty darn good shape .. maybe a slight edge bump. At this time, Cunard was struggling to keep the QE2 profitable and these cruises sure helped! 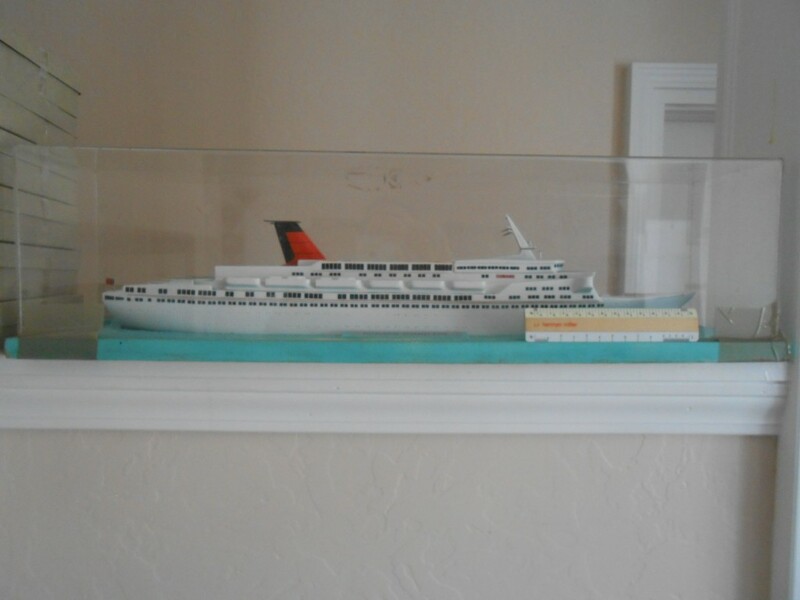 Cunard Line: Cunard Countess/ Princess Agency Model. 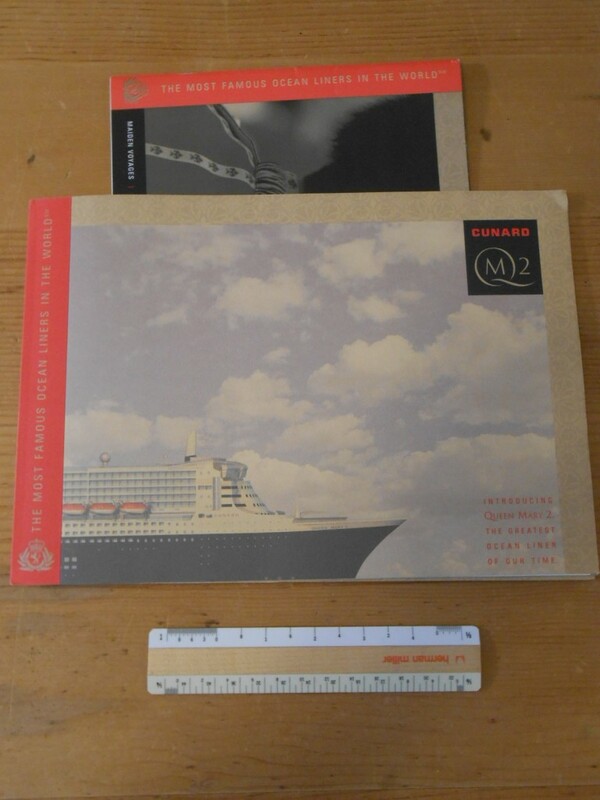 Cunard Line: QM2 ship brochure and fist years sailing brochure. A modern liner like no other .. the QM2 is touted as the successor to the lovely and then soon to be retired QE2. The first ship brochure is full of renderings on the QM2’s interiors and amenities… the 2 story dining room is awesome! The second brochures covers her many “maiden” voyages as well as first season of cruising etc. 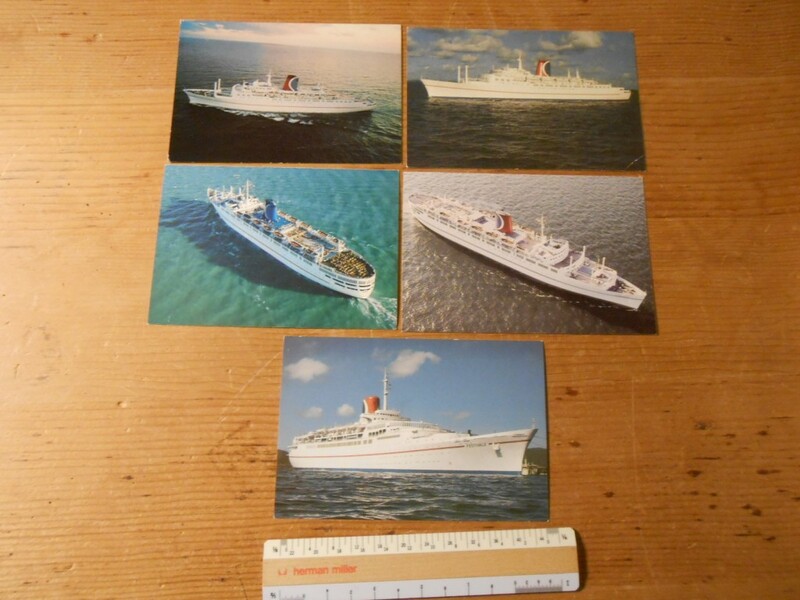 Direct from Cunard/Carnival.. you won’t find early info on the QM2 that is better than these! Seattle agency sticker .. Great condition! 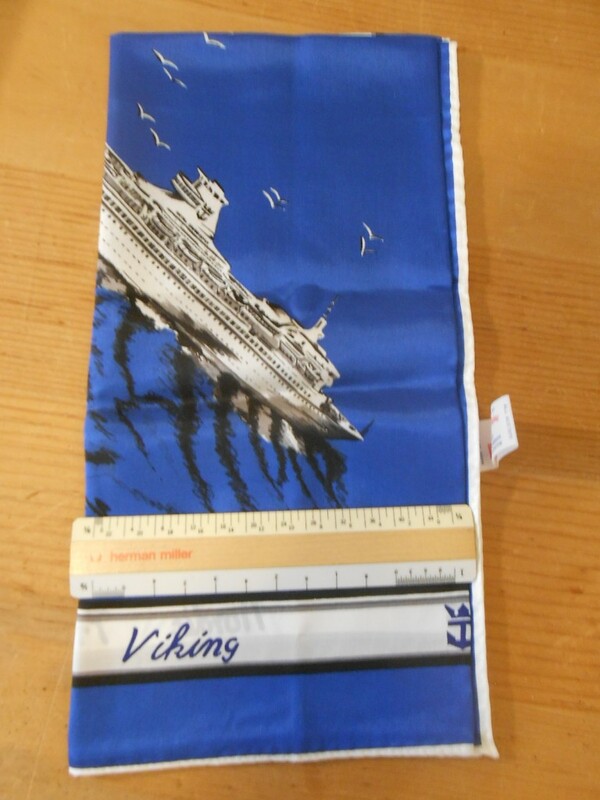 Lovely Blue scarf for one of the earlier RC ships! These ships were always easily identified my their unique “Funnel” Lounge. Superb profile of a ship in one corner .This is a heavy scarf … made of acetate… in pristine shape! 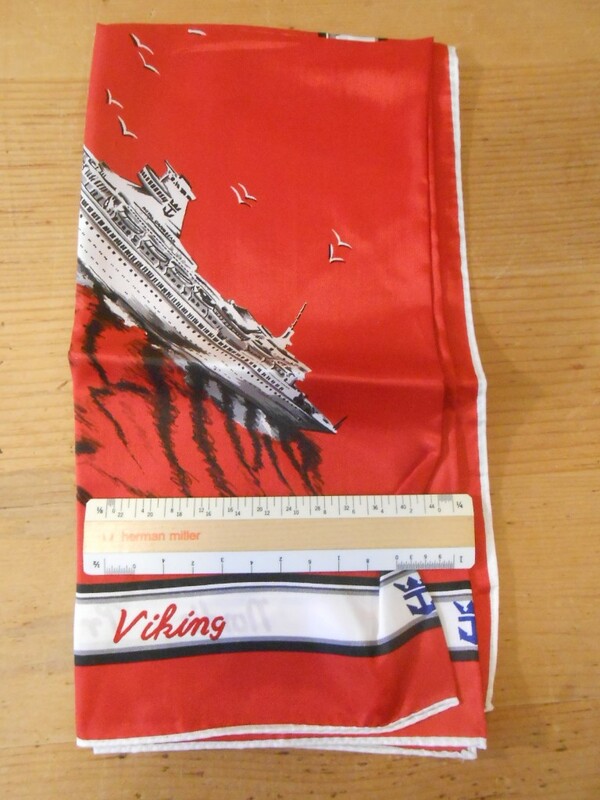 Lovely Red scarf for one of the earlier RC ships! These ships were always easily identified my their unique “Funnel” Lounge. Superb profile of a ship in one corner. This is a heavy scarf …made of acetate… in pristine shape! 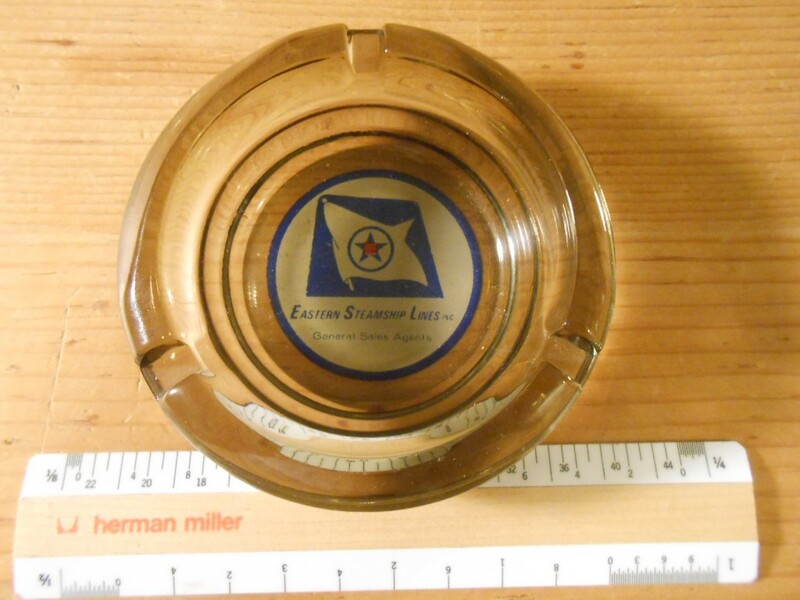 Excellent ash tray swiped from one of Eastern’s pioneering ships that sailed out of Miami. I’d like to think this came from one of my favorites: the Bahama Star.. or maybe the New Bahama Star. Excellent shape with no chips or flaws. Great for the smoking sect. 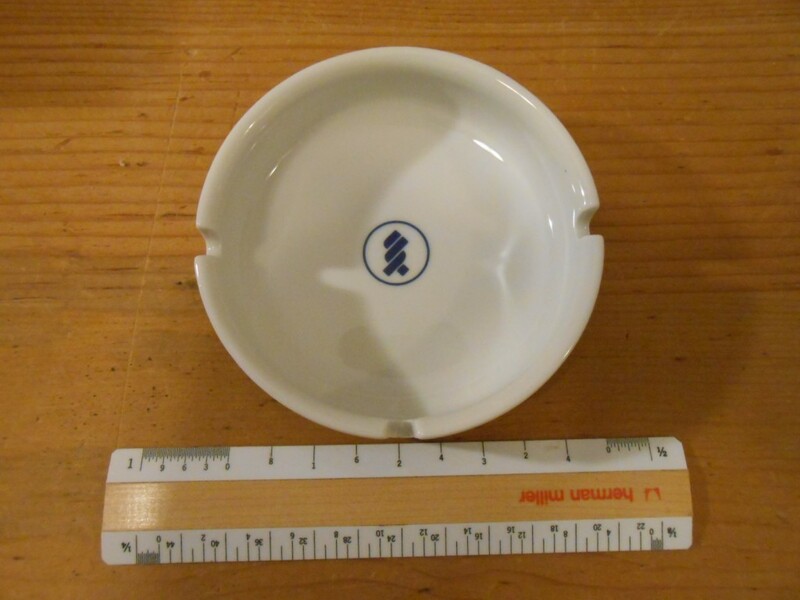 Lovely souvenir dish for the ship’s Maiden Voyage in 1970. Outstand ships , the ships image was in gold and the rim is trimmed in gold as well. the SKY was one of the 4 near sister ships that put NCL on the map .. and later prompted Knut to purchase the SS France and rework her into the SS Norway. Excellent condition! Excellent resin trays … these look to have never been used. They are a little bigger than most resin ship trays… and have a much higher edge construction. The Atlantic was one of Home Lines last ships and was modeled heavily on the Oceanic of 1965 and recently was retired from MSC Cruises. Excellent set of cards .. unused an still wrapped in plastic. Features the Emerald Seas on the cover with green trim. The Emerald Seas was purchased from Chandris after they had her totally rebuilt (from the APL President Roosevelt). These were probably bought on board and saved as a gift. Excellent condition. 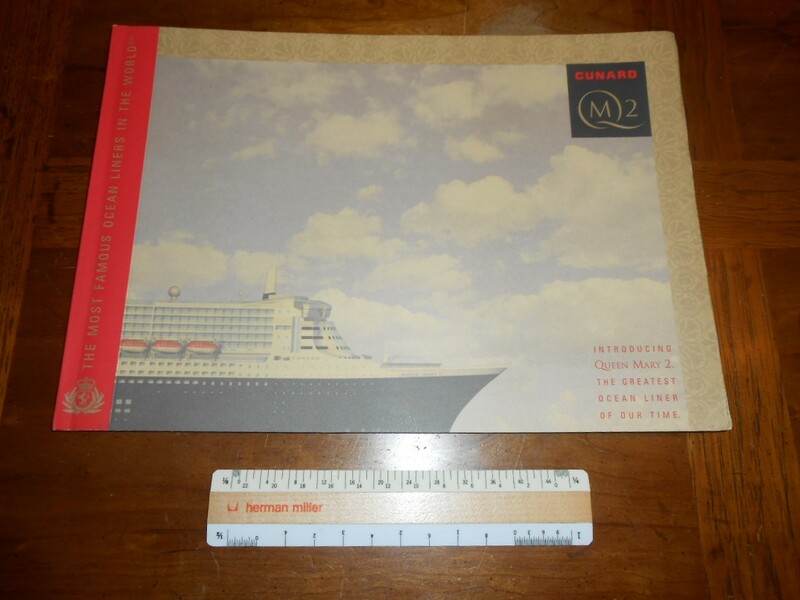 The large extravagant intro Brochure for the QM2 , how can this be described other than lovely? 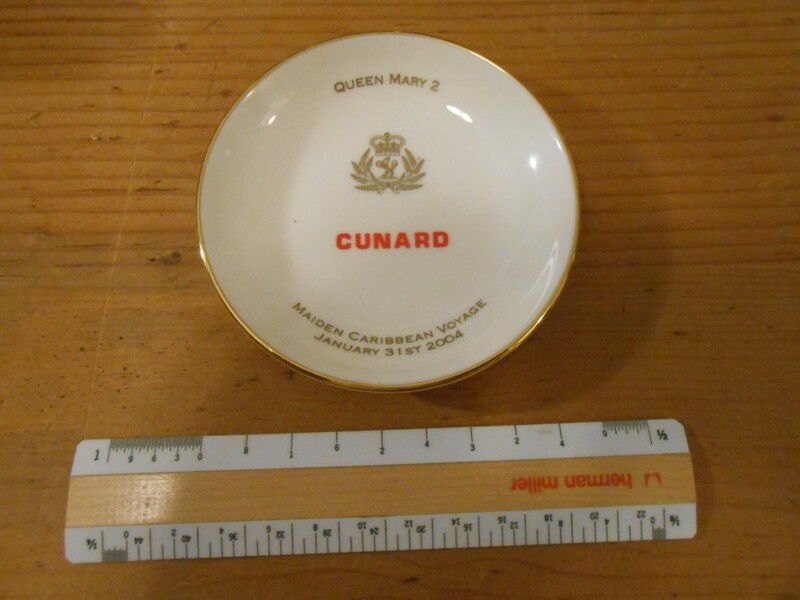 Cunard sure markets and capitalizes on the traditional and nostalgic aspects of the vessel and ocean liner travel .. and of course the ships relations to her historic retired fleet mates. 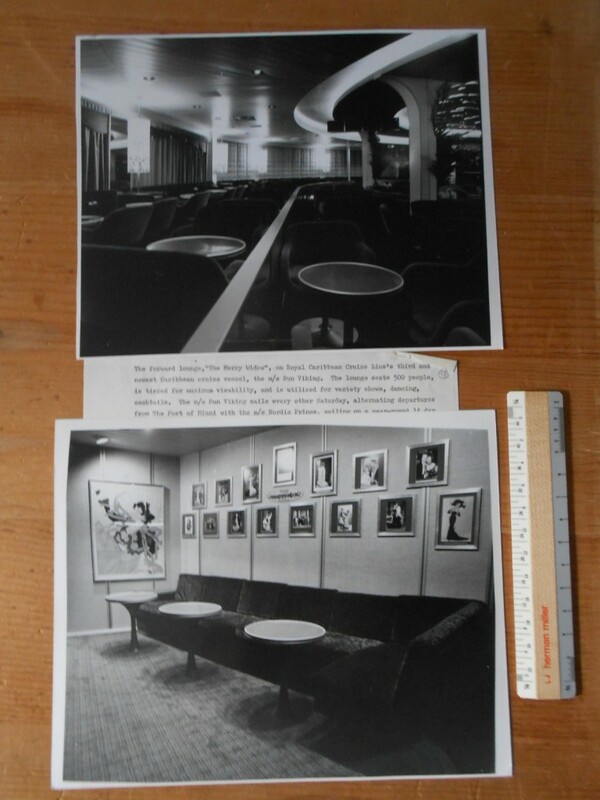 The brochure if chock full of renderings of the ships interiors … most are almost too real looking not to be true photos! The insert in the back covers all of her voyages for the first season. Truly a modern masterpiece! A little bump to the cover corners. 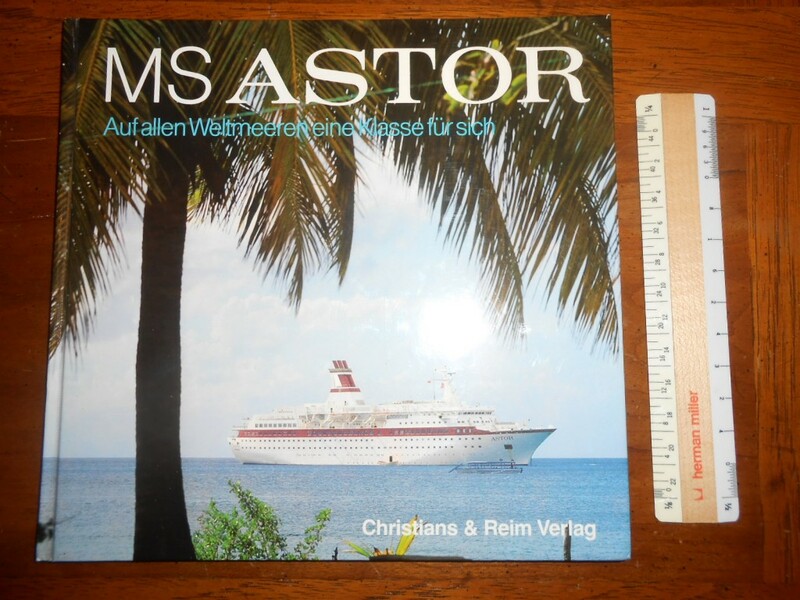 Safmarine: MS Astor Hard Cover Builders Book. Pristine builders book for this unique little gal. 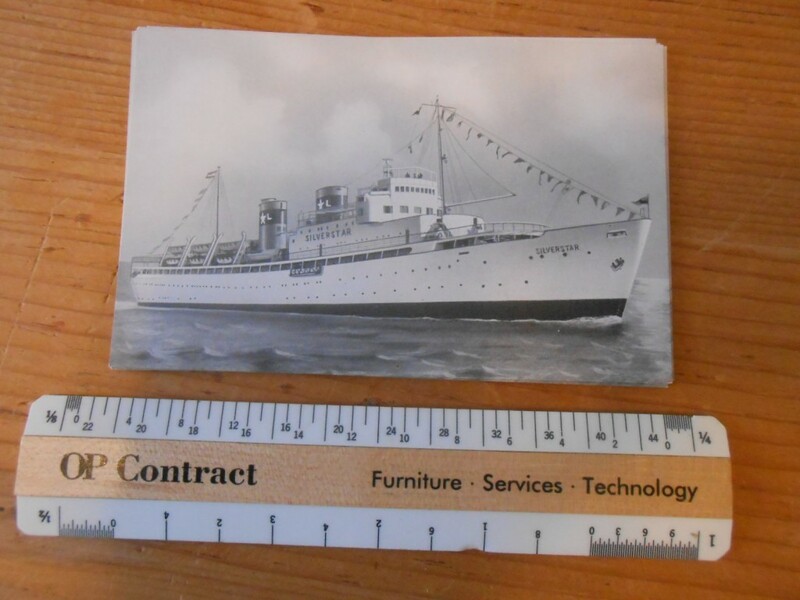 I can remember about the first time I ever went to a travel agency to obtain “cruise brochures” the Astor was about the newest vessel on the ocean and the agency had a rather large display dedicated to her, and I am sure I have an early brochure for her from that trip. She was built for Safmarine to sail the England to South Africa route that was abandoned by UC/Safmarine almost a decade earlier. Within a year the rout failed and she was sold to the Russians. Pretty detailed book on the ship bow to stern and keel to mast top! These are cards form Carnival’s first 2 sets of newbuilds: Holiday and Tropicale and then of course Facination and Celebration. They embarked on a never ending building program .. and Joe Farkus became richer and richer introducing hotel/casino like interiors. This was not cruising like in the olden days. The cards are in great unused shape. 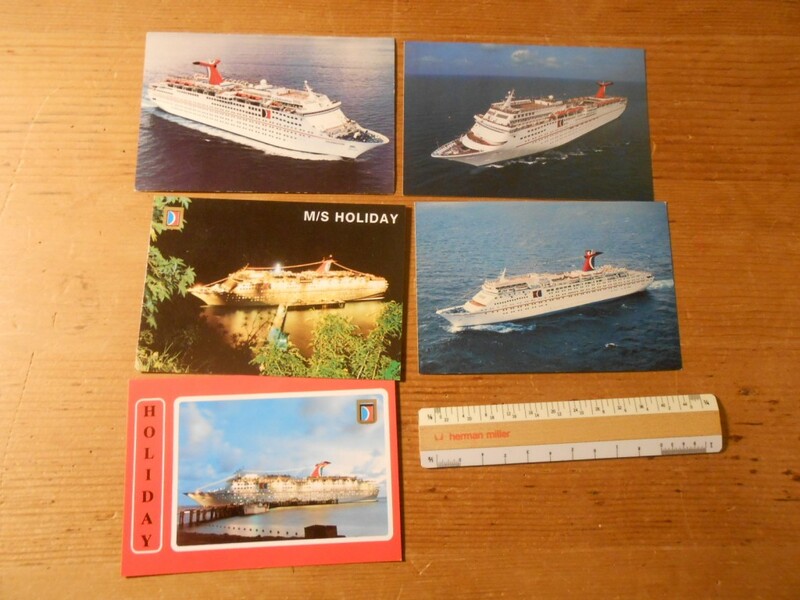 Nice set of post cards for the first 3 ships that put carnival on the map .. the Mardi Gras, Carnivale and Festivale. These 3 ships laid the foundation for what is the Carvival empire today. All cards are unused. though they do have some minor imperfections. There are 2 for MG, 2 for Carni and 1 for Festi! 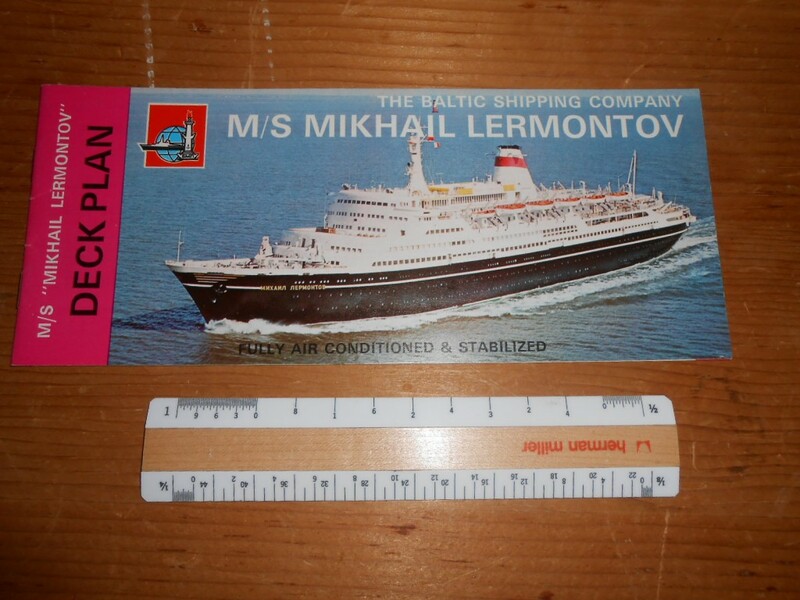 The Mikhail Lermontov was the last poet ship built for the Baltic Sea Shipping company. She sank on cruise after hitting rocks off the shores of New Zealand in 1986 .. and the wreck site has become a destination for divers. This is a perfect deck plan for this ship and showing interior views… a very rare find and in excellent condition! Though the Black sea Shipping company she was built for is long long gone , the Alexandr Pushkin still sails today as the ss Marco Polo. She was the flagship for BSC and was the largest of their “poet” class. 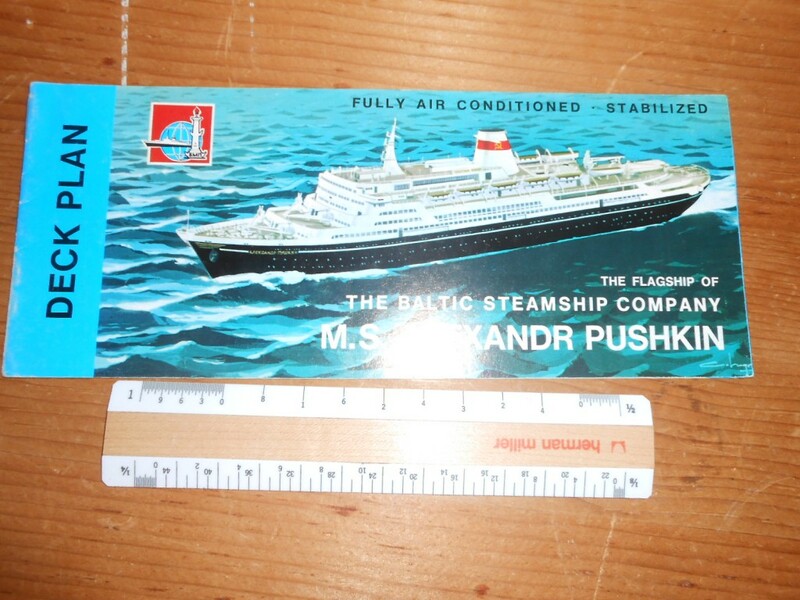 This is a perfect deckplan for this ship and showing interior views… pretty hard to find and in excellent condition! 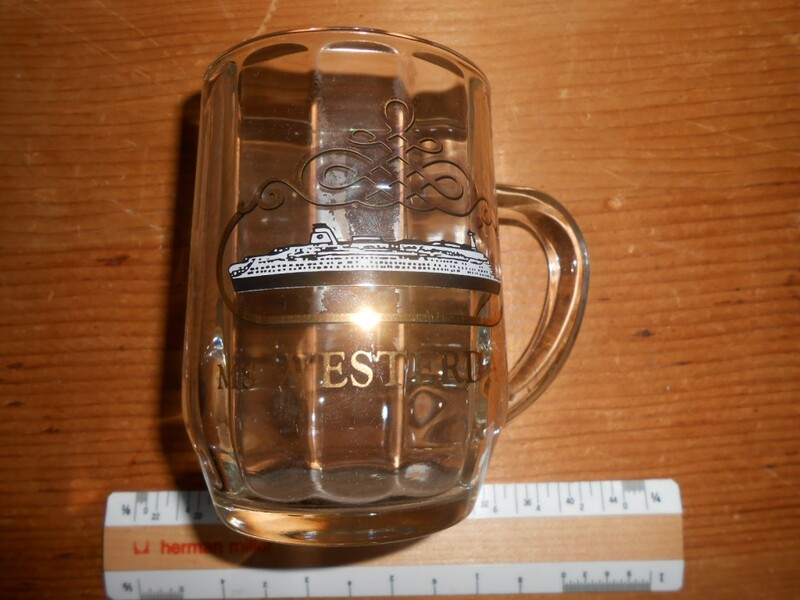 Nice crystal clear glass mug for the lovely Westerdam. The ship is outlines in gold and black and the cup is made from molded lobes of heavy glass. Certainly an onboard purchase as a memento or gift. Nice a souvenir mug from the SP. 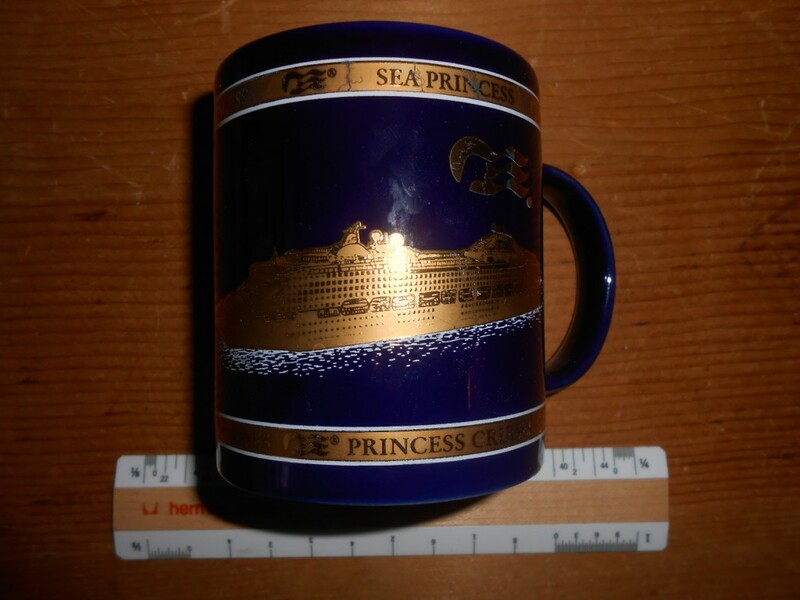 This rich dark blue ceramic mug has the ship outlined in gold and includes her vital statistics. 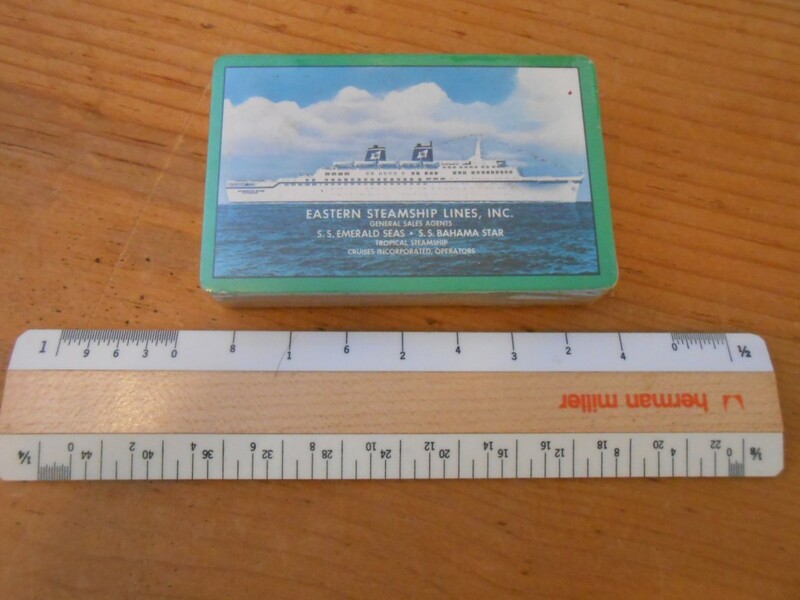 Certainly a gift ship purchase, from a descendent ship of the “Love Boat Line”.